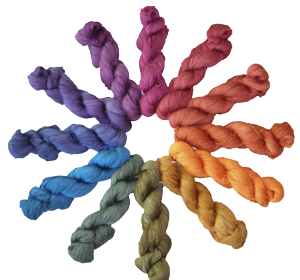 We are a small company that dyes silk and silk-blend yarn, fiber, and fabric by hand. We started this business because we could not find the colors that we ourselves wanted to work with, and so we attempt to bring the widest possible range of color choices to weavers and other fiber people. We do not discontinue colors, and we will attempt to match anyone�s color need for the sheer exercise of it, without additional fees. You may also request your own color picks for the multi-colors or variegated. Just email the colors or send a sample, the type and size yarn you wish, the quantity, your name and and phone number. I will get back to you with the delivery date and invoice. When the yarn is ready to ship, I will email a photo and arrange for payment. The	yarns pictured on the website, except where they are otherwise marked, are all 20/2. This is our most popular yarn and therefore it is what we have the greatest quantity of in stock. We try to keep this size stocked at all times in all of our color wheels. Occasionally, however, demand exceeds supply, especially when we are on the road (please see our traveling schedule). As for our other yarn sizes, we cannot afford (yet) to keep all of them in stock in every color. We wish we could. In the meantime, we dye them as the orders come in if we do not have them in stock, and we do it as fast as we can. This adds about a week to the total shipping time, depending on the size of the queue and where we happen to be (again, please see our traveling schedule). We are always happy to hear from you, so if you have any concerns or questions, please do not hesitate to contact us.